With Sepp Blatter's re-election for the fifth term in office on Friday, despite acrimonies against him over the spate of corruption in the world's soccer confederation, democracy has again proved that it can be counted upon as the bastion of the people's will. And that if there is any the problem with democracy, it is the attempt by some powers to tinker with its outcome by not allowing whatever the people have decided as final, allowing protection of special interests over the people's will. On the Eve of Blatter's reelection, there were calls for him to step down, because United States' investigators uncovered bribery and kickback schemes among FIFA's officials, and 14 people arrested and charged. But Blatter fought back saying that he condemned the corrupt acts within FIFA, but that he can possibly not keep tab on all human affairs within the organization. There was a threat from the United States to work against Blatter's re-election in favor of Jordanian Prince Ali Husseini. Observers say the U.S posture against Blatter is normal in democracy, but that the problem arises with people who think Blatter should be held responsible for corrupt acts, though he has not been linked to any misdeed. Curious observers say that asking Blatter to quit for acts perpetrated by others is like a case of asking the president of a country to step down because his country is corrupt when the leader has not been found culpable for any act of corruption. They say that an unpopular leader can be treated with such disdain, but not for a leader who is popular among people in his constituency. People had thought Blatter would lose the election with news reports describing FIFA endemically corrupt and putting the fault and responsibility of the leadership. Some sections in the soccer has politically seized on the development and asked Blatter not to seek reelection and that if he is reelected, they may be exiting FiFA. After the news of Blatter's re-election, some skeptics have continued voicing loss of support for the FIFA's president. Some say he may not complete the fifth term as president, and some of his own compatriots see something happening that will scuttle Blatter's presidency two years into his fifth term. 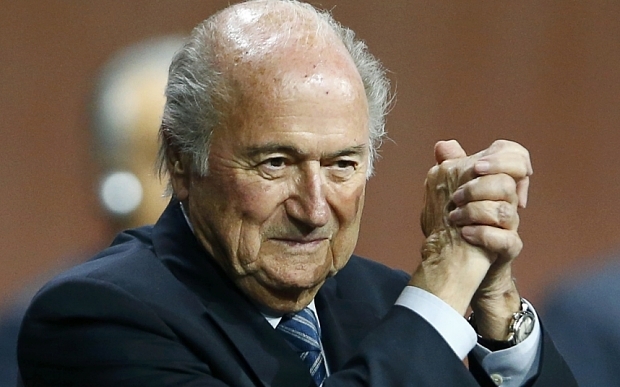 Meanwhile, Blatter has thanked FIFA's delegates for re-electing him. He says that now he is the president of everybody. New York Times has reported that Richard Weber, the chief of I.R.S unit in charge of criminal investigations said he was fairly optimistic that there would be another set of indictments in the FiFA case. But he has not said anything about the case having any link to Blatter. Observers are saying that until Blatter is directly linked to the bribery and the kickback schemes, there may be little anyone can do to get him down, unless the world will once again say like it has been witnessed in Egypt where some powers see the people's choice as a felon and the people has to be denied their choice through global manipulation and conspiracy.